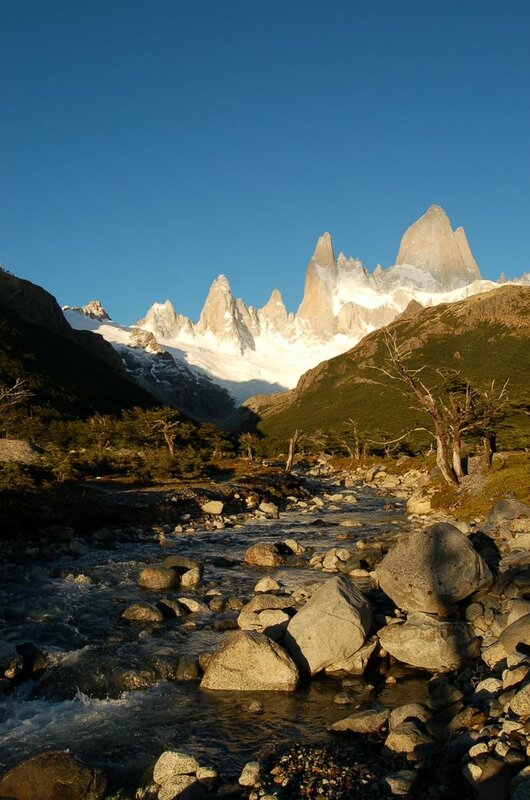 El Chalten was built by the Argentinians in 1985 to stake their claim on the remote territory surrounding the jagged peaks of the Fitzroy massif. With one main street, two supermarkets and five campsites, it is not the town itself which attracts visitors, but the stunning mountains which lie just to the north. 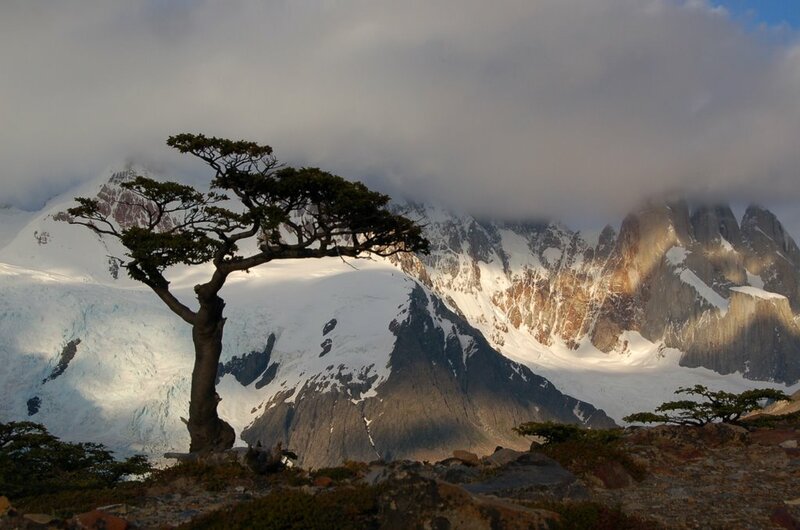 Named after Robert Fitzroy, captain of the Beagle, the ship that brought a young Charles Darwin to Patagonia as naturalist, the steep rock towers and spires dominate the landscape. Battered by the howling winds which scream off the Southern Ice Field, climbing the peaks is a serious proposition undertaken by few. 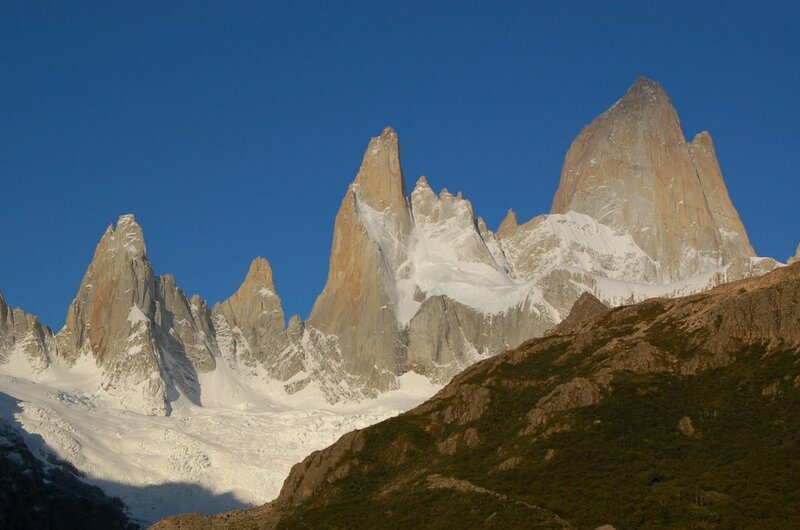 First summited by two French climbers in 1952, Mount Fitzroy is still only successfully climbed on average once a year. Our more modest undertaking was a 3 day trek taking in the views of Mount Fitzroy and, a few hours to its west, the spire of Cerro Torre. It was raining when we left the township and it did not stop for the next 12 hours. Cold rain driven by cold winds, our hands were numbed and we zipped ourselves into our cocoons of goretex. We pitched the tent on muddy ground at the base of the mountain, invisible in the low cloud, and walked to a nearby glacier to watch small chunks of ice falling into the lake. It was a gentle introduction to the Patagonian weather; locals told us that the wind can get so strong that cars are blown off the road. The morning brought perfect blue sky and we climbed a steep path ahead of the groups to an amazing look out nestled beneath the cliffs. The peaks looked impossible to climb, but we saw two small teams of climbers, laden with gear, snowshoe their way off across the glacier. In the afternoon, we walked west through mature woodlands. The path was smooth packed dirt, a foot wide - it would have made the perfect mountain biking trail - and, as we descended, I mentally rode my bike through the corners, over the drops and between the trees. We camped in a small woodland by the outflow from Lago Torre and, after soup, climbed the loose glacial morraine behind camp. 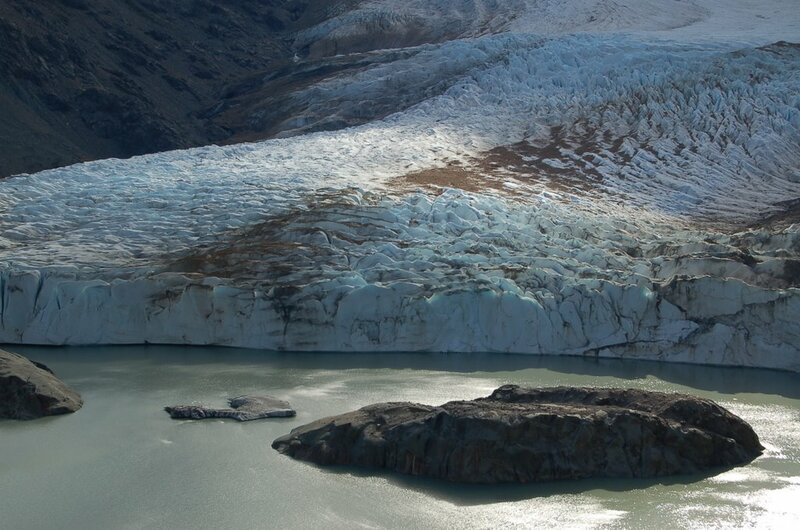 From the ridge, we looked across the ruffled water, hemmed in by steep cliffs, to a glacier at the far end. Albane climbed to a look out twenty minutes up the hillside to get a better view of the snout of the ice while I sat scanning the cloud for a glimpse of Cerro Torre. In 1959, an Italian claimed that he and his climbing partner, who was swept to his death by an avalanche on the climb, reached the summit. The claim has been disputed by most climbers due to inconsistencies in his account and the lack of equipment on the route. 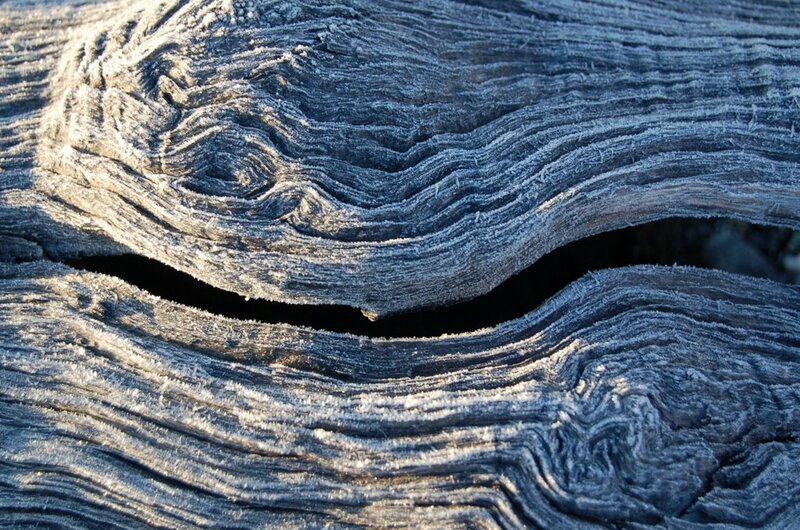 The fact that the alleged route was not climbed until 2005 supports the doubts over the claim. What remains undisputed is that the weather is the predominant factor in climbing the peak. 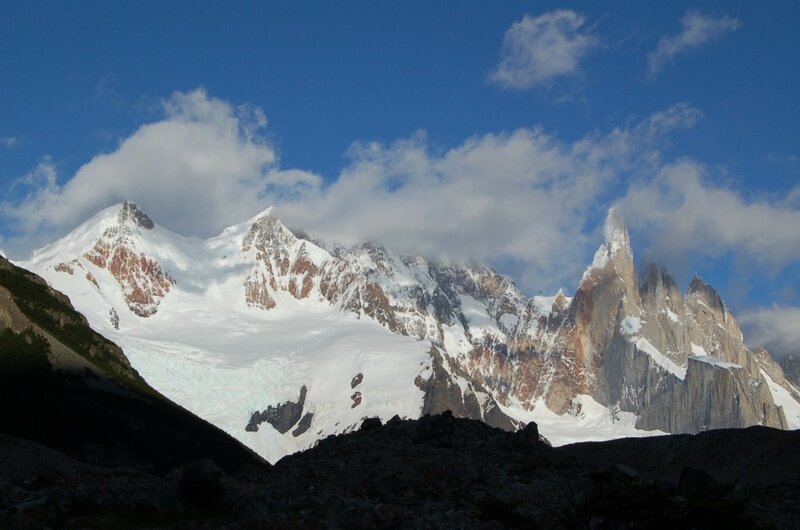 Many climbers wait a month to even see Cerro Torre. At dawn the next day, I climbed alone to the ridge and saw the dawn light on the mountain. The morning was cold, but the view of the rock, ice and cloud kept me there until I shivered and jogged back to camp for porridge. We walked back to El Chalten in hot sun and ate cherries watching the wind blow dust clouds down the main street.